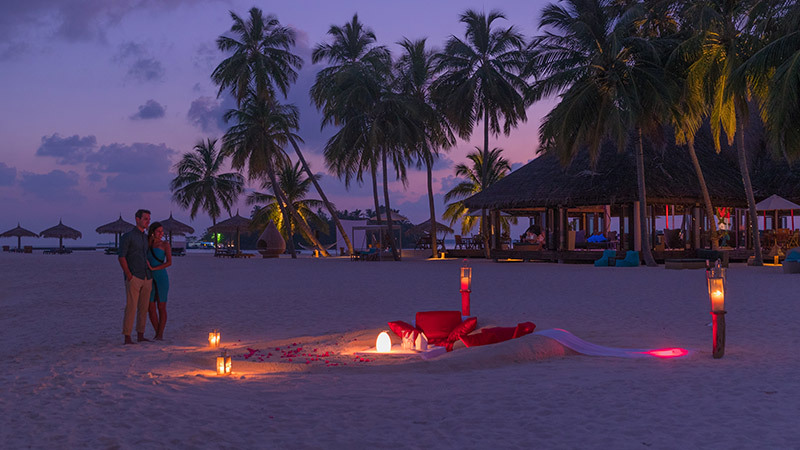 Savour an exquisite intimate meal with your special someone beneath the starlit Maldivian skies, surrounded by the soothing sounds of the ocean waves at a beach location of your preference. The perfect way to begin your evening. Watching the sunset into the Indian Ocean sipping chilled Champagne served along with homemade canapés and indulge in an evening to remember. Served in the most romantic and quiet beach of the Island. Your personal waiter will serve you an exquisite menu while you contemplate the sun going down into the Indian Ocean. Truly an experience you won’t dare to miss during your stay. One of the most requested dining experiences at Veligandu. Taking place on the beach located in front the swimming pool, the charismatic ambience induced by the sea breeze and the waves of the Indian Ocean, together with a special menu created by Executive Chef Siegbert Horn will give you a night to be remembered. Set comfortably on a sandy table and chairs dug into the soft and white sand. The feeling of the sand between your toes along with the fresh breeze on your skin will create the most romantic venue to complete your holiday. For more information or to order your desired Beach Dining experience, please contact our Food & Beverage Team or Guest Services directly.